“All we are, and all we seem / Is but a dream within a dream,” Shakespeare said so, and it must be true. 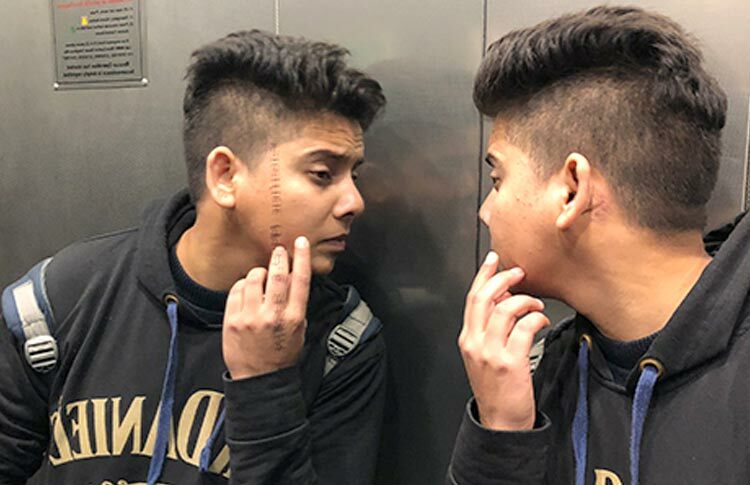 “Sometimes I would dream of going to sleep as a girl and wake up as a boy,” says Anshuman Chauhan; his other monikers – including Shwetanjali [Don], Raksha and Raano – are feminine. Please Mind the Gap is a documentary by Mitali Trivedi and Gagandeep Singh that negotiates both the Delhi metro and (trans) sexuality alongside Anshuman Chauhan. In a space of continuous movement, Anshuman is a gripping hook. Trivedi says they filmed conversations with Anshuman, who identifies as transgender, on the metro for over a year. His sincerity and simplicity are carried on into the film. “For us, the Delhi metro is a queer space,” says filmmaker Gagandeep Singh. No wonder in final shots, the documentary leaves you lingering on rainbow-colored fairy-light intersections of a Delhi metro map. While the film may be an attempt at queering public space, at the film screening at India Habitat Centre, Anshuman admits gender identity is often a personal negotiation. On the surface, says cinematographer Manjesh Rana, the metro appears to be gender-neutral technology. However as the camera reveals, spaces in and around the metro are a negotiation. Anshuman says he feels embarrassed at the guards’ reactions when he attempts to enter women’s toilets. He also dreads being frisked at security checks at the metro, where guards may touch his chest. “Insult ho jayegi” he says, explaining how he feels conflicted while travelling with a woman friend. How then does he prevent being identified as female, when he identifies as male? At the screening, Anshuman says you had to find the solutions yourself. His own was to protect his private parts from public scrutiny. Once he familiarised himself with men’s bathrooms, Anshuman realised he could do his business while being seated, even in a toilet designated for men. Someone he met on the metro – another transman – also suggested he use binders to flatten the upper body. Chest-binders were not fail-safe, but even if a security guard were to feel a breast, says Anshuman, they would perhaps be embarrassed and behave more respectfully. It is clear Anshuman cherishes and protects his identity as a man. When he passes through detectors and people call him “brother”, he says he avoids picking up the phone because he may have to respond as a female. When he is in the female-only compartment, the camera captures Anshuman registering he is out of place, and walking hurriedly into the mixed-gender compartment. Anshuman says he prefers to sit in the space between two compartments, resting his back on the folds so his back gets a massage. Over the years, Anshuman has embraced his dream-identity. Sometimes a person steps into the metro as a woman, and steps out as a man. **Mitali Trivedi has a Master’s in Gender Studies from Ambedkar University, Delhi, and is a research scholar at the Department of Sociology, University of Delhi. She is involved in theatre and has been working with Abhigyan Natya Association – a theatre organisation for over half a decade. Gagandeep Singh is a lawyer and a theatre practitioner. He is deeply interested in the historical evolution of laws and holds a Master’s Degree in Environmental Law. Chitra Kalyani is a writer based in New Delhi.